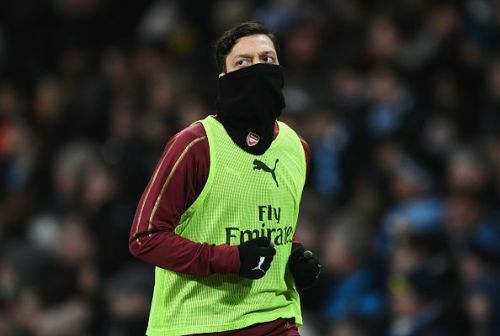 Mesut Ozil, who is the highest earner at the Premier League club Arsenal, was jokingly told by club legend and Sky Sports pundit Paul Merson that retirement might be a better option for a player who can't get into the current Gunners' squad. Merson commented on Ozil's absence from Arsenal's Europa League RO32 clash at BATE Borisov, which the club lost 1-0. The pundit was surprised at the omission of the German midfielder, whom he believes to be the best player at the Emirates and urged coach Unai Emery to reinstate him into the squad to get back to winning ways. Paul Merson was an academy product of Arsenal's youth academy and won the league title twice as well as the FA Cup once in the Gunners' jersey which he donned for 11 seasons. Ozil was the club's record signing when he landed in London from Real Madrid at the beginning of the 2013-14 season. The 30-year-old retired from international football after Germany crashed out of the World Cup last summer. Currently, it is reported that the playmaker earns £350,000-a-week, but hasn't put up performances that justify that kind of salary. Paul Merson joked that if the player is finding it difficult to break into Arsenal's current squad, he must be considering retirement as a viable option. "I don't know if they[Arsenal] are trying to push him into retirement, because he must sit there and think he might as well retire if he can't get into Arsenal's team." "He has to play because he is their best player." "Arsenal have to stick with him, they are not good enough not to have him in the team." Unai Emery claims that Ozil is part of the club's future and he's not thinking about the player leaving the club next summer. But, only time will tell how the club handles the player's deteriorating situation. Pablo Fornals: the perfect player who can replace Mesut Ozil at Arsenal?